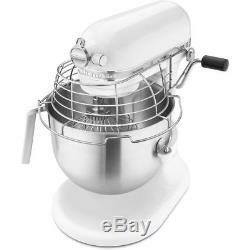 KitchenAid 5KSM7990X 6.9 Liter Professional Bowl-Lift Stand Mixer, 220/240 Volt -- NOT for use in the USA Can be bought here but not operated here. KitchenAid's most powerful, quietest available: 1.3HP high efficiency DC motor is designed to run longer and delivers optimum torque with less heat buildup. Easily handles recipes requiring longer mixing, kneading and whipping times. The all-metal, precise gear design produces a smooth, quiet sound. Large capacity: Easily mixes recipes with up to 16 cups flour, 14 dozen cookies or knead dough for 10 loaves of bread in a single bowl. KitchenAid's most efficient: Advanced feedback control communicates in microseconds to the motor to ensure optimal power is delivered to the bowl. Speed-Control protection: Built-in safety feature reduces the risk of accidentally turning on the mixer when wiping it clean. Includes 6.9 liter brushed stainless steel bowl with J-style handle, stainless steel 11-wire elliptical whip, burnished stainless steel flat beater and stainless steel spiral dough hook. Perfect for use hotels, restaurants, bakeries, delis and many more. Wattage 325 Watts Horse Power 1,3 HP Voltage 220 - 240v Rotation Speed 40 - 200RPM Bowl Capacity 6.9Ltr Dimensions: 417(h)mm x 371(w)mm x 371(d)mm Weight: 14.8kg Motor Type: DC Frequency 50/60Hz. 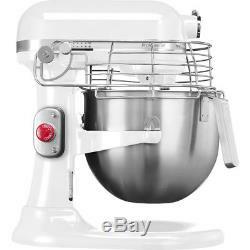 The item "KitchenAid 5KSM7990XEWH 6.9 Liter Stand Mixer, 220/240 Volt Not for Use in USA" is in sale since Monday, January 22, 2018. This item is in the category "Home & Garden\Kitchen, Dining & Bar\Small Kitchen Appliances\Countertop Mixers". The seller is "bakedeco" and is located in Brooklyn, New York. This item can be shipped to United States, Canada, United Kingdom, Denmark, Romania, Slovakia, Bulgaria, Czech republic, Finland, Hungary, Latvia, Lithuania, Malta, Estonia, Australia, Greece, Portugal, Cyprus, Slovenia, Japan, China, Sweden, South Korea, Indonesia, Taiwan, South africa, Thailand, Belgium, France, Hong Kong, Ireland, Netherlands, Poland, Spain, Italy, Germany, Austria, Israel, Mexico, New Zealand, Singapore, Switzerland, Norway, Saudi arabia, Ukraine, United arab emirates, Qatar, Kuwait, Bahrain, Croatia, Malaysia, Brazil, Chile, Colombia, Costa rica, Panama, Trinidad and tobago, Guatemala, Honduras, Jamaica.